If you thought that this upcoming season of Game of Thrones would be all sunshine and rainbows, think again. Like the prior six seasons of HBO’s epic saga, everything will be dark, grim, and snow in the world of Westeros. While we’ve still got 55 days before Season 7 premieres, there are now a few more images to hold us over for the time being. 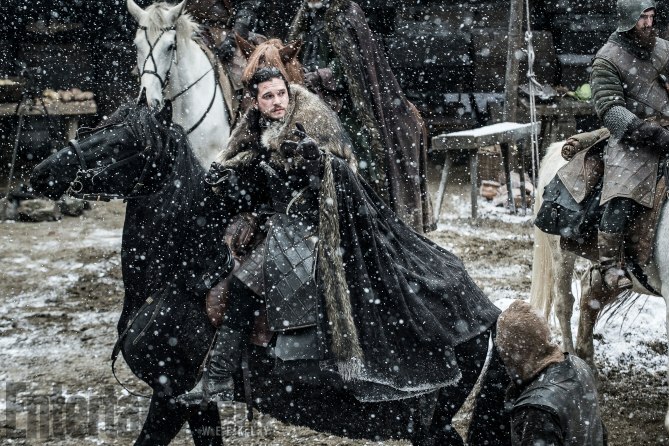 Entertainment Weekly released this brand new image (along with a few others that have us all kinds of excited), and while Jon looks like he’s SEEN THINGS, at least he is still alive and clearly still fighting. Check out that epic cloak, too. That is the cloak of a KING. Also can’t help but notice that snow is gently falling in Winterfell, and you know what they say: Winter is coming. So is Game of Thrones, but not soon enough.